I finally did it. After many delays and much anxiety, I published Caught Somewhere In Time on amazon.com. I did it without any fanfare or mention online a little over a week ago. To date, I believe every copy sold has been to a friend or family member, which is fine for now. At some point, I will advertise it or something. For right now though, it is enough for me to be proud of myself for crossing another item off my bucket list. My bucket list was never very long. For the most part, I consider myself a pretty low-key person. Sure I make goals like everyone else, but mine are usually short-term or at the very least not overly lofty. I started my list when I was young, before I knew what a bucket list even was. Some kids want to grow up and be doctors or astronauts, but my career took a backseat in those days. When I grew up, I wanted to be a Dad. And so my list began, and that was the first item checked off it as well. Later, years after high school was finished, I told myself that someday I wanted to go to college. I did that eventually too, and checked that off my list as well. Now I have published a novel, and got another checkmark for my effort. There is only a few things left on my bucket list now. The one I look forward to most rcurrently is watching the sun rise and set over the ocean in the same day. I think that one is especially appealing right now because it implies a vacation. So now I can actually call myself an author, where before I was merely a writer. If you found this blog from the copyright page of my novel, then I thank you for reading it and hope you enjoy(ed) it. If you found your way here another way, I would encourage you to buy a copy… and not just because I want to get paid for my work. That was never the reason for writing it. I just want you to enjoy it, and share it so others can enjoy it as well. I like joy. Joy is good. With Star Wars Day coming up tomorrow, I decided to get a head start on watching the Star Wars series again. I don’t do it every year, but with the house to myself this particular weekend (a very rare occurrence), I thought I would do it. Since I had the time, and didn’t want to FORCE myself to squeeze them all into one day, I got a head start on Friday, May the Second. I watched a little more off and on throughout May the Third, and found myself halfway through The Empire Strikes Back shortly after dinner. At this rate, I will only have one episode left watch (unless I start it tonight yet) on Sunday, May the Fourth (be with you). As I generally do when re-watching any of my favorites, I started picking them apart in my mind looking for flaws. I am sure there are plenty that I didn’t notice, but there was a great glaring flaw in A New Hope that struck me today. Allow me to set up the particular scene: The Death Star had already destroyed Alderaan, and had just traveled across the galaxy (that is far, far away) to enter the Yavin system. It very, agonizingly, slowly orbited the planet in order to use its primary weapon to destroy the moon where the Rebel base had been built, giving the Rebels plenty of time to destroy the battle station. The first problem lies in the fact that after coming clear over from the wreckage of Alderaan, presumably using a hyperdrive or similar technology, it didn’t just zip far enough past the planet that it could stop and fire. No, it arrived at exactly the opposite side of the planet and opts to adopt an orbit. It doesn’t go up or down to attack from over one of the poles, and it doesn’t counter-orbit to allow the moon’s own orbit to help span the gap. It finds the absolutely slowest route to reach the moon and creeps up on them. While grumbling to the screen about that, a voice in the back of my mind brought up an even better point. The Death Star has the ability to destroy a planet, thus revealing the second problem: Why didn’t they just blow up the planet Yavin? Realistically, if the planet was blown into billions of little asteroids, a couple of things would happen to wreck that Rebel moon-base. First is the shockwave from the explosion that would impact the moon, searing the atmosphere and anything on the surface on that side of the moon on the level of many nuclear bombs. This is a pretty conservative guess based on how much of the planet was visible in the sky over Yavin 4. If the base happened to survive that, the extreme weather caused by the superheated atmosphere wouldn’t take very long to become unbreathable. Of course, the chunks of the planet pelting the moon might move faster than the atmospheric changes. If all of that wasn’t enough, the destruction of the planet would remove the source of gravity that kept the moon in that region of space and replace it with thrust in some undetermined direction. There is the movement around the planet and outward force, spinning the moon uncontrollably into anywhere. It could get knocked into another moon (there were at least 4 of them after all), or farther from the local star where it would freeze, or closer into the star where it would cook. In any case, the faster spin of moon as it was flung away would increase gravity drastically, and no one would have the opportunity to leave if they survived the initial blast. In short, why even target the moon? Worst case scenario is that they target the moon with a second shot if the planet’s destruction doesn’t get rid of the base. I guess none of this matters though. The ability to destroy a planet is still insignificant next to the power of the Force. I had a thought while watching Back To The Future Part 3 recently. 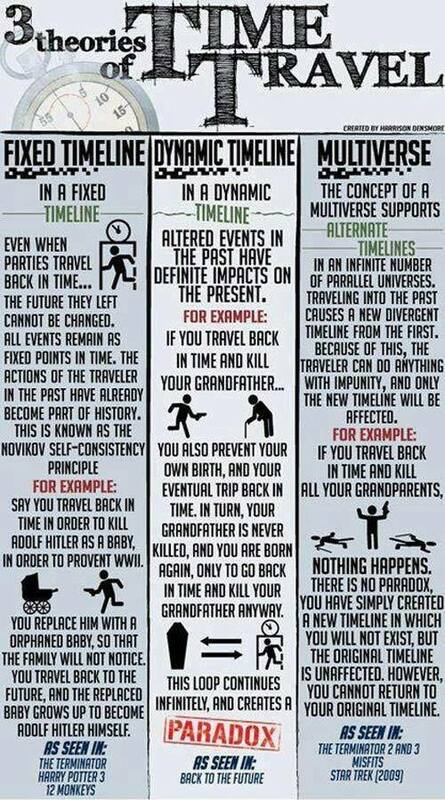 For the most part, the changing of timelines used in this movie series follows a consistent pattern, even if it’s not one I personally think is realistic. It is a work of fiction though, so I am willing to suspend my disbelief for the purpose of entertainment. There is one gaping flaw though that I never noticed until this watching. At the beginning of Part 3, there is a historical picture of Doc Brown, alone, in front of the infamous clock tower’s clock face. Shortly afterward, Marty finds Doc’s gravestone, buried by his beloved Clara. Additionally, in Marty’s original timeline, Clayton Ravine is named for a teacher who died crashing into it, Clara Clayton. These three things cannot all co-exist however. If Doc Brown was in the clock tower photo alone, then Marty had not yet gone back in time to when it was taken, at the town festival. If that were true, then Doc Brown would not have gone out to the unbuilt bridge (prior to the photo and festival), because the whole purpose of that trip was to look at the feasibility of using the tracks to take the Delorean home again. In short, if Marty had not gone back to the old west, Doc Brown would not have been nearby enough to save Clara from the ravine. Doc must have saved Clara from the ravine prior to his burial however, because Doc’s gravestone had her name listed as the person who buried him. For continuity’s sake, one of two things should have been done differently in the film, given that Marty’s absence from the original clock photo cannot coexist with Clara’s name on the gravestone. The first option is to have Marty in the photo all along, and just have Doc not allow him to see it. That would be an easy catalyst for Doc helping Marty go back to the old west in the first place. This also follows the logic set forth in the previous films that you can’t just go changing things around. Think about it, in the first movie, in 1955, Doc was angry that Marty wrote him a letter with information about the future. Now, a day or two later in 1955, Doc is suddenly ok about meddling in his own future. Having Marty in the photo would correct two inconsistencies at once, since not only would it be ok for 1955 Doc to send him to the old west, but it also allows for Clara to remain alive to bury 1885 Doc. The second option is to have Clara’s name appear on the tombstone’s photo only AFTER Marty goes back in time. That would have been easy enough to accomplish, because Marty could simply note, while in the old west, “Hey, that name wasn’t there before.” Doc could still dispell the notion of love at first sight, and the remainder of he movie would have been virtually unchanged. In my opinion, the movie people should have gone with both of these options concurrently. Really, with as much as the plot of the second film twisted around on itself, tweaking these two things shouldn’t have been too confusing for the average movie-goer to follow. The inconsistencies created therein would be easy enough to explain away: If Marty was in the clock photo, then Doc wouldn’t have been buried at all… except that Doc’s death was dependent on other factors and decisions as well, which hadn’t been made yet, and thus the changing gravestone photo. Although, come to think of it, the second movie did have it’s own major flaw: if old Biff gave his younger self the sports almanac, and then returned to 2015, like he did in Back To The Future Part 2, he would have returned to a future where he had been rich and where George McFly had been dead a long time. Instead, he came right back to the same 2015 where George McFly was visiting Marty and family for rehydrated pizza. And in the first film, why did 1985 George and Lorraine not recognize their son from the 50’s? I mean, they did name their third kid after the guy that introduced them, but didn’t recognize him when they saw him again? You know what, forget about it. These movies have plenty of flaws, but never cease to entertain me despite them. I have been staying busy, working at my new job and trying to find both the time and inspiration to write. There has been some difficulty recently in my personal life, family stuff and money. Did I mention my new job? Maybe I complain too much or make excuses for why I don’t put finger to keyboard more often. That’s just dumb. To hell with that. I’m still writing. The plot ideas congealed into an ugly sort of story. I started it twice and tossed it aside, but the third time really does appear to be the charm. I changed the location, the perspective, and even the writing style a bit, focusing in on just the core part of the concept. So now I have a tragic love story to hammer out. I also started another sci-fi piece aimed more at a younger audience. This one is based on a joke I made to one of my teenagers before they were teenagers. Of course they didn’t laugh, due to the fact that it wasn’t funny, but it got me to thinking. Also, my kids call me “Science-Dad” sometimes, and this is just an extension of that name. I hope to put some basic physics lessons into the minds of tweens without them realizing it. I am shutting down the book’s website. After considering it for a long time, I think it would be silly to maintain a website for a novel, one novel out of all the ones still in my head. That left me with two options: First, I could maintain separate websites for any and all novels I write (to be fair), but then when would I write with all the web stuff happening? Never mind the day-job, family, pets, other hobbies, and etc… Second, I could just shut it down, publish the damn thing like I want to, and post an extended excerpt of it here. The first ten chapters (Part 1 in its entirety) of Caught Somewhere In Time is now posted here on this website. In this form, it’s an open-ended novella that will hopefully attract people to buy the whole thing once I get it formatted right. The book’s website, where I actually wrote the novel as a serial, is gone,..ish. I won’t be renewing the URL, so if you want to buy it, have at it. Maybe I’ll get famous and someone will want to make a movie out of it, then you could get some money from squatting on the URL. Or not. I guess your incentive to invest will depend on how good you think the book is. Caught Somewhere In Time is now online in its entirity over at www.caughtsomewhereintime.com. Go read it and let me know what you think. Comment here, since comments are disabled on the other site. Although, the more I think about it, maybe I should create a place for comments on the story’s website. Thanks for reading! Unfortunately, “The Center of Eternity” has been put on hold indefinitely and its associated web page will be shut down in a few months as a result. There are multiple reasons for stopping for now: First, and foremost, I was unhappy with the direction the story had taken. I hoped it would remain on par with the first novel in the series, but the more I wrote it, the less it followed the same formula. While following a formula is not always the best process for writing, it seems to me that sequels should complement their predecessors in style and content. Another reason for the stoppage is that unforeseen circumstances in my life made it increasingly difficult to continue writing as much as I would like. Also, with the first book in the series not even being fully available yet, new readers had cause to struggle understanding some references from one not yet revealed in the other. Lastly, with “Caught Somewhere in Time” being my first full novel, I think I should perhaps write something else before jumping into a full series. There are a few other ideas that I have tossed around, and they excite me a bit more than this particular project at this time. If I am able to overcome the recent circumstance quickly, thus giving myself more writing time, concentrating on something more exciting to me should yield better results than this story gave. To be clear, this story is not gone forever, only delayed for a while. If this decision is not what you hoped for, please feel free to tell me so in comments here or one of my social networking websites listed below. Having too much to do is a problem I’ve been face with lately. Whereas when I initially wrote Caught Somewhere in Time, I had only work, school, and family to worry about. Now that I have finished school, I thought that maybe I’d have more time. The last year has proven that to be completely false. Work got busier, and it seemed family got busier also, as if to fill in the void left in my day where I used to study. My wife says sometimes that if something is important to me, that I’ll find a way to make it happen. Easier said than done though. When I realized a few months ago that a whole new round of edits would be needed for CSIT, and I decided that it was time for the sequel, I was sure I’d be able to make it important, and therefore find the time. Right now I have the time to work on it, but I’m blogging instead. Why? Because this, I decided, is also important. Since its relaunch, CSIT is posting weekly instead of its original biweekly schedule while I was originally writing it. This is what I wanted to do the first time around, but I ultimately gave myself some really good advice: If I put too much pressure on myself to meet a tough schedule, I will be unhappy writing, and both me and my story will suffer. So every two weeks allowed me time to write and give a first edit before releasing a chapter. Once I finished the epilogue, I decided I’d better do a word count, and found that I had too long a book! So I decided what would get cut (don’t worry, the plot is not affected and some things are simply being moved into the sequel instead), and decided to make fewer chapters by combining pieces and rearranging too. This gives me more options regarding the future of this piece of writing. Now with weekly release dates and longer chapters, CSIT will seem to move faster than it did if you read the last posted draft. The Center of Eternity is posting biweekly now, so I have time to write each piece of the story. These chapters will be similar in length to those of CSIT, and I will focus on keeping the book a decent length, so it also has options for the future. I am only a beginning author, and I have no delusions of grandeur. For now I am happy just to write and be read, and this medium seems to be a good way to do that. I want to be careful however, not to put unnecessary limitations on myself in case something good does happen. So I have stayed busy, trying to keep my writing important to me, but not letting it overpower any of the other things I’ve got going on. I like to blog, but always seem to struggle with what to blog about. Writing my books is different in that I know where I want them to go and what they should say. There is a plan, a point. That is where blogging loses me a little. I can sit here and type about whatever happens to be going on, or what I’m thinking about, but that jut seems terribly mundane to me. I’m an author and I intend for my stories to be interesting. Unfortunately, my own experiences and goings-on suffer from a lack of excitement, as if it is all saved from my own life to be unleashed later in writing. Now, for example, I am writing this while assisting my son with his own writing homework. A book report, as you can imagine, is far from interesting on its own. Add to this that it is not even a book have read and that it is even below my son’s reading level, and you get the idea of exactly how incredibly unblogworthy my current situation is. Here I am anyway, pounding it into the keyboard anyway. Wonder what this says about me as a person? So blogging is a chore for me currently. Not a chore in the sense that I feel I have to do it against my wishes. Don’t get me wrong. It is a chore in the sense that it difficult for me to come up with things to say. Call it selective writer’s block if you will. So now we move on to what I’m actually thinking about. As it turns out, I am thinking that I need to go cover to cover on Caught Somewhere In Time again and edit it with a more acute eye. I have also thought about scrapping my initial design for my front cover. It is in the nature of every creative person to never be quite happy with the final product of any of their creations. This venture is no different for me. I want to be finished working on it, but somehow cannot let it go without making a few more tweaks here and there. I gave myself a deadline for exactly this reason, so I would not continue working it to death. I also have been thinking about a vacation recently. In a perfect world, this would consist of my wife and I in a grass hut over the water somewhere warm. In this world it will most likely have my children along on only a day trip to the ocean in the rain. That’s how we roll. I cannot really allow myself to step out of work, home, and writing for long enough to take a real vacation right now anyway. School is still in session for the kids, I am needed at my day job due to someone else’s absence, and there is that deadline I set for myself.